You've heard the phrase. You've probably used it. You may have thought about it; you may have ignored it. You may understand its meaning even experienced it firsthand or you may think it's not true at all. But where did this phrase originally come from? Thomas Wolfe (1900-1938) was an American novelist considered to be a major writer of the early 20th century. Unlike some, he became famous during his lifetime through four lengthy novels, numerous short stories and dramatic works. His work is known as being highly original and he is seen as one of the first masters of autobiographical fiction. His famous contemporary William Faulkner said that Wolfe was their generation's best writer and his influence is seen in the writings of Jack Kerouac, Ray Bradbury and Philip Roth. As an aside, autobiographical fiction or autofiction as the name implies is a literary work which merges autobiographical and fiction elements. It is partially fact, partially fiction, changing names and locations and recreating events to render them more dramatic. There is no pretence of exact truth; events are altered or exaggerated for artistic purposes. - Artistic license or poetic license is a term used to describe the distortion of fact to supposedly improve a piece of art. This could be literary art or could be a visual art such as sculpture or painting. Wolfe was born and raised in Ashville, North Carolina. In 1929, he published his first novel "Look Homeward, Angel". It was an autobiographical novel that fictionalized his early experiences in Asheville, the narrative chronicling family, friends and the boarders at his mother's establishment on Spruce Street. In the book, he renamed the town Altamont and called the boarding house "Dixieland." His family was fictionalized under the name Gant, with Wolfe calling himself Eugene, his father Oliver, and his mother Eliza. "You Can't Go Home Again" is a novel written by Wolfe but published posthumously in 1940. While the story is original, I can't help thinking that it is a curious retelling of the writing and publication of Wolf's first novel. I'm sure this wasn't necessarily the author's original intent but is probably more a connection with the concept of autobiographical fiction. Why can't you go home again? If you search the Internet, you can find others have discussed the phrase, dissected it, and summed up their own experiences by repeating it. In light of the above description of Wolf's literary work, what can one conclude about this idea? I find it interesting to note that there are two main reasons why any of us "can't go back home". First, "home" changes. Heck, some people can say that their childhood home has been torn down to make way for a strip mall! Add to that the other changes. Mom and Dad may no longer be with us. Childhood friends have moved on. And etcetera and etcetera. But the second reason is that we ourselves have changed. How can "we" go "home" because the person we are now is not the person who was originally at home? Imagine me, a grown-up man, going home to live with Mom and Dad as if I was nine years old. How's that one going to work? Let's not forget though how our memories of home become fuzzy. We may be nostalgic for the good ol' days but just how good were those ol' days? We're longing for some ideal we have in our head, an ideal which may in fact have never existed. We may remember living at home with Mom and Dad as being good but we have forgotten the skinned knees, the bouts with the flu and all those times Mom and/or Dad did not allow us to do what we wanted. What about the chores? It wasn't completely a free ride. In my posting Nostalgia: Ah, but you can never go back, I say that even if you manage to get back, it is never the same. At university, I was pals with a guy. We had some great moments in class, in the cafeteria, studying for exams and shooting pool. Years later, in a fit of nostalgia, I looked him up and we got together for a coffee. I had moved on; he had moved on. It was pleasant swapping stories but we really didn't have anything between us. That time spent together was very much due to the moment, to the mutually shared experience of going to university. Without that experience, we didn't have anything, nothing which could be construed as a friendship. Over the years, I have come to accept this as a fact of life. You share a moment, have a good time then say sayonara, adios, meet ya on the other side. This is a life altering experience. You are crossing a line never to step back. You are walking out the door never to walk back in. You are "leaving on a jet plane" but unlike the lyrics of the song you know you won't be back again. In my posting Nostalgia: Ah, but you can never go back, I talk about leaving someplace, taking that last nostalgic look around before walking out the door. Nostalgic? Ha! I haven't left yet and I'm already feeling nostalgic! However it's because I know I probably will never see that place again. I go to the door; I turn around and take a last look. I remember the good times, the bad times, all the various incidents that occurred. I don't know what will happen tomorrow. Will I back? Or is this the last time I'll see this place? I don't know but somehow I must remember that every journey inevitably comes to an end. That may not be the most desirable thing but if it is so, I must remember I had the luck of taking the journey in the first place. Unlike leaving university, or leaving a vacation spot, leaving via a divorce is not the nicest of experiences. Even if you are the one initiating this change, it can be, ah, unsettling. Certainly in reading a number of blogs written by people recounting their experiences before, after and during the proceedings, it would appear that all parties end up irrevocably changed. Sometimes for the good; sometimes for the bad. Out of all the blogs I've read, I would have to say that Molly Monet of the blog Postcards from a Peaceful Divorce seems to be an exception to the rule. Out of all the divorces I've read about, this may be one of the few where the protagonists have not just about killed each other but have managed to arrive at some sort of post divorce friendship. Shouldn't everyone be so lucky? In the May 10, 2011 article on the Huffington Post "Truths Of Being A Divorced Dad", the author starts off by saying: Divorce carries with it a stigma, a harrowing possibility that life will never be as good as it was. Mr. Sturges goes on to talk about being a divorced father, what it meant to him and what he did. Life is what happens. It is a defensive game. You have to be prepared for anything to happen, because anything can happen. Like divorce. Who gets married expecting that to happen. The author's truths turn out to be obvious and straightforward but I imagine that everyone in the midst of these most traumatic of times may not be able to clearly see beyond the end of their own nose and the personal and emotional pain they are suffering. I would advise anybody reading this article to click over and read the entire article by Tom Sturges. Well written and as I said, insightful. As Pauline Gaines of Perils of Divorced Pauline amusingly commented on the Huffington page: "Could you be my ex-husband? Please?" User mallen123 makes an interesting comment on the same Huffington Post page. Thank you for writing about the civility, restraint, and compassion required to maintain a healthy and happy family. Divorce is all about adjustment in the face of pain and unhappiness. "What do you want your children to remember?" is the question I continually ask myself. In the end, it isn't about me or how I feel about my ex-spouse. Many of us feel that we were wronged and hurt for no good reason. As difficult as it is, we must put aside our personal pain and focus on being the best parent and ex-spouse possible. Ten years from now, I want my children to know how much they were loved and respected even if their dream of an intact family wasn't realized. As you noted, we don't expect divorce when we marry. But, what we should rely upon is our own ability to be the bigger person for the sake of our children and our own self-esteem. Use divorce as an opportunity to get closer to your children. Make peace with your pain. Time tempers hurt feelings and allows us to regain perspective. Show your children that adversity can still be an opportunity for love, caring, and a better life. Animosity and resentment never bring happiness. You can't go home again. It's over; get used to it. Lot's wife looked back and she turned into a pillar of salt. (Genesis 19:26) It would seem the best advice is to always look forward, to always move forward. After all, we are constantly moving away from the past towards the future so should we not set our sights on what will be and not on what was? Is anybody going to say that's easy? I know it's going to hurt when I take off the Band-Aid but it's true; ripping it off in one tug is the best way of doing it. It hurts but it hurts less in that you don't drag it out. Tom Sturges said, "Divorce carries with it a stigma, a harrowing possibility that life will never be as good as it was." There's no doubt that life will be different. I pull off the Band-Aid and discover a scar, but the skin is healed. The scar may fade; it may always be there, but the skin is healed. Tom and the various people who commented on the article presented some wonderful ideas. "What do you want your children to remember?" For that matter, what do I want my family, my friends, even my colleagues to remember? It isn't about me. As difficult as it is, we must put aside our personal pain and focus on being the best parent and ex-spouse possible. Animosity and resentment never bring happiness. It isn't easy, but all of us have to drop it, get over it and move on. What other choice is there? We may quibble about the details, but in the end, believe it or not, I would like to see everyone happy, successful and at peace with themselves and the rest of the world. Yes, you can't go home again but you can make a new home. Thomas Clayton Wolfe (October 3, 1900 – September 15, 1938) was a major American novelist of the early 20th century. Autofiction is a term used in literary criticism. Coined by Serge Doubrovsky in 1977 with reference to his novel Fils, autofiction refers to form of fictionalized autobiography. Autofiction combines two paradoxically contradictory styles: that of autobiography, and fiction. An author may decide to recount his/her life in the third person, to modify significant details or 'characters', using fiction in the service of a search for self. It has parallels with the faction, a genre devised by Truman Capote to describe his novel In Cold Blood. The non-fiction novel is a literary genre which, broadly speaking, depicts real historical figures and actual events narrated woven together with fictitious allegations and using the storytelling techniques of fiction. The non-fiction novel is an otherwise loosely-defined and flexible genre. The genre is sometimes referred to as or faction, a portmanteau of "fact" and "fiction". 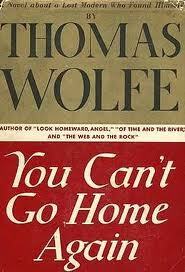 You Can't Go Home Again is a novel by Thomas Wolfe. It was published posthumously in 1940 from the October Fair manuscript. This always happens to me. I travel; I stay some place then I hesitate when I leave feeling a touch of nostalgia. Business recently required me to fly out West for an overnight stay; one of those fly in for a meeting, fly out immediately afterwards. Despite my short stay, I hesitated at the door of my hotel room. Of course, a last look around for anything I may have overlooked but also to have a last look at some place I would never see again. "Leaving on a Jet Plane" is a song written by John Denver in 1966 and most famously recorded by Peter, Paul and Mary. Peter, Paul and Mary's version first appeared on their 1967 Album 1700; however, it did not become a hit until they released it as a single in 1969. It turned out to be their biggest (and final) hit, becoming their only #1 on the Billboard Hot 100 chart in the United States. It was the second to last #1 single of the 1960s. Tom Sturges is executive vice president and head of Creative for Universal Music Publishing Group. Founder of the Manhattan Beach, California, Unified School District’s inspiring Every Idea is a Good Idea GATE Program, he is an active volunteer with LA’s at-risk youth. When appointed a position as a mentor of a child from an inner city class, he was unable to pick just one child, excluding all the others, so he did the unthinkable: he asked to mentor all 37 children in the class. He continued to mentor them all the way through adolescence, an experience which inspired the award-winning documentary, Witness The Dream. He is also the author of Grow the Tree You Got. Tom lives in Los Angeles, California.